Editor Hannah Lee challenges you to look at your nail art pricing structure to determine whether you're selling yourself short. Are you charging enough for your services? Specifically for your gel-polish-nail-art manicures? With the proliferation of salons offering what I call “The Pinterest Effect” nail art, now more than ever, clients are expecting more out of their “manicures.” They want something that looks like the nails they’ve seen on those amazing inspiration boards on Pinterest or hashtagged all over Instagram. These days it’s likely the manicure your client is looking for is actually a gel-polish or gel manicure. We industry folks know it’s not the same sort of manicure, but clients might not really understand why it costs more than a basic manicure. Clients know they have to cure their nails under a UV lamp and they know it lasts longer. But plenty of them still consider it “just a manicure.” You should be charging at least $10-$15 more for a gel-polish mani than a basic manicure, but many of you are not, according to our Big Book research. A good rule of thumb for pricing nail art is to base it on the complexity of the design and the time it takes you. An accent nail could be as simple as a painted moon. Or it could be a multi-colored chevron design that takes considerably more time. I don’t think these two nails warrant the same price. Some nail art is incredibly time-consuming. Some of it includes expensive embellishments. Nail art pricing is really a beast of its own. If you’re doing a sizeable nail art business, it would be beneficial to develop a separate nail art menu that showed samples and pricing. Make it available both in the salon and online (that way, your clients won’t be surprised by the price when they arrive). It also gives clients the option to pick something they like on their budget. Nail art is a service area with potential for higher income and profitability. And right now, it’s a hot commodity. Harness “The Pinterest Effect” to make more money and really charge what your time, skills, and cost of goods are worth. One-price-fits-all is definitely not the way to go. 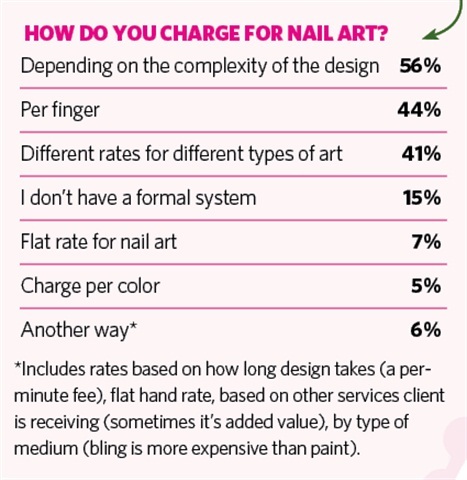 How do you charge for nail art? Email me ([email protected]) and include links to your menu or pictures of your pricing.